LARGE WHITE VICTORIAN CANDLE LANTERN home decor, jewelry, decor, decorations, electronics, fountains, floor mats, art glass, vases, garden essentials, fireplace screens. 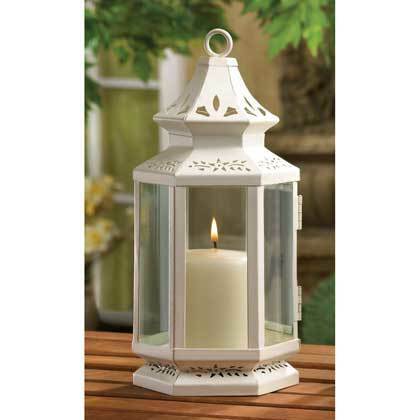 A lovely decoration with an historical feel, this lantern brings to mind the candlelit ballrooms of Victorian times. A faultless addition to any classic decorating scheme! Candle not included. Material(s): IRON and GLASS. Weight 1.2 pounds. Dimensions 5" x 4.25" x 10.5".